RockResult Ads will flood your screen and even not allow you to browse the web without any interruptions, if you do not remove an advertising-supported application causing you inconvenience. RockResult, which is responsible for RockResult Ads, might enter the system rather secretly because it tends to travel bundled with free applications and computer users install it without wanting to do that. If you have already detected RockResult on your computer, you should not let it stay because this undesirable application will not act in a beneficial way. Actually, the main goal of RockResult is to generate traffic to different websites as well as advertise products and services, which means that it is not going to improve your browsing experience. You should not keep useless programs on the system, especially when they might lead you to threats; thus, we suggest that you delete RockResult as soon as possible and thus stop RockResult Ads from appearing. As you have probably understood, RockResult might expose you to threats, which means that it is rather risky to keep this application on the system. The specialists of pcthreat.com suggest that you avoid all the programs published by Super Web LLC because they all act identically. It means that they will generate advertisements and might take you to unreliable webpages, if you keep clicking on the advertisements. Besides, they might perform other undesirable activities as well, for instance, connect to the internet without permission and even collect information associated with your online behavior. RockResult creates a folder called RockResult in %PROGRAMFILES%; thus, if you want to make sure that this application has really infiltrated your system, you should look for this folder first. If you have managed to find it, there are no doubts that this advertising-supported application is residing on your system. Do you want to protect your computer from future infections? If so, you should definitely install a security tool on your system. Unfortunately, not all of them are reliable, which is why we advise you to make sure that the malware remover that you are going to install is completely trustworthy. 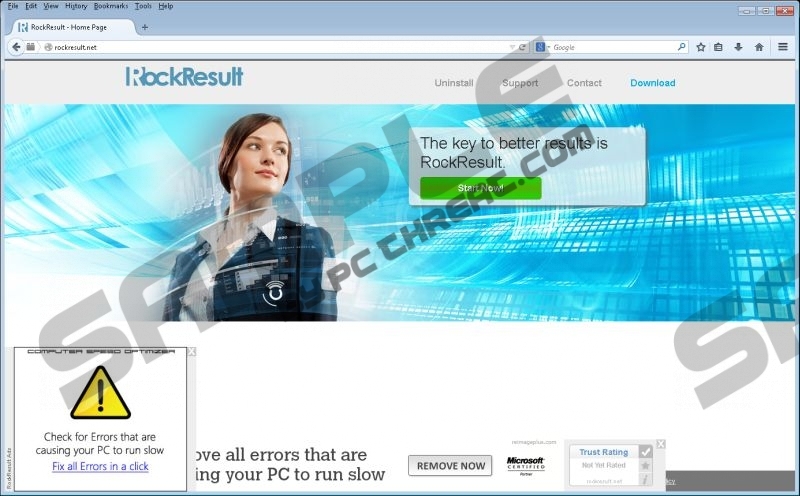 You should not keep RockResult on your computer for any longer because this suspicious application might attract other infections and burden your browsing session. Scroll down below and you will find the instructions that will help you to delete this advertising-supported application from the system. Do not forget that it is also advisable to scan the system with a security tool because there might be other infections on your system. Access the Metro UI menu (tap the Windows key). Find the application that has to be erased. Select it and then click the Remove button. Quick & tested solution for RockResult removal.